Swimming is an enjoyable and an extremely productive way to exercise, working all the major muscle groups to tone your body. Not only is it refreshing, but because of its' resistant qualities, water is an excellent environment for a great fat-burning workout. Swimming is also a low-impact exercise, so there is far less stress on your joints and therefore less risk of sustaining injury. 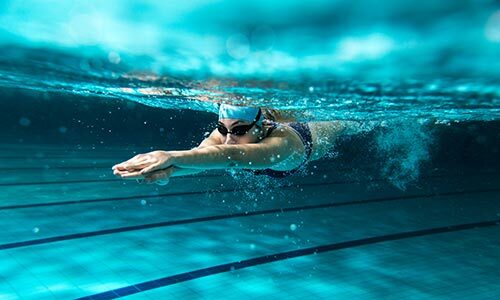 Our pools have dedicated lanes for lap training and our aqua classes offer a great way to stay in shape. All our centres that have a pool offer swimming lessons. Our swim schools provide the perfect environment in which to successfully learn how to swim or improve your swimming. Our small group sizes make the learning curve quicker and ensure all pupils receive a high standard of hands-on tuition.